Canadian #1 Genie Bouchard will make her Atlanta debut in July. ATLANTA, March 6, 2017 – Tournament Director Eddie Gonzalez announced today that defending champion, Nick Kyrgios, along with the United States #1 ranked player, Jack Sock, will lead a star-studded summer field at the BB&T Atlanta Open, to be held July 22-30, 2017 in Atlantic Station. 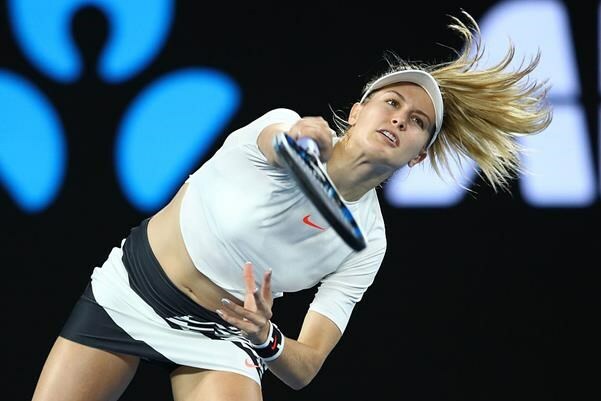 It was also released that Grand Slam champion Venus Williams and Canada's #1 ranked player and Sports Illustrated Swimsuit Model, Genie Bouchard, will be featured in a special Sunday, July 23 women's exhibition evening session. Tickets are on sale now. Kyrgios, the 21-year-old from Canberra, Australia, is currently #17 on the ATP World Tour singles rankings. He is the holder of three ATP World Tour titles (2016: Marseille, Atlanta, and Tokyo). In 2016, Kyrgios defeated three-time BB&T Atlanta Open champion, John Isner, 7-6(3), 7-6(4) to win his first American title. "I'm looking forward returning to Atlanta to start my US summer and defend the BB&T Atlanta Open title," states Kyrgios. "Last year, the crowds were great and it was probably the best week I've had on and off the court in a long time. It was just rewarding that I played well." Top ranked American, Sock, is 24 years old, and is currently ranked No. 18 on the ATP World Tour singles rankings. Sock has already won two titles in 2017 (Auckland and Delray Beach), and has an 11-1 record to date this year. Sock has played in the BB&T Atlanta Open on four occasions, reaching the semifinals once (2014). "Obviously, I'll be trying to build on the past success I've had at the BB&T Atlanta Open, and I'll be looking forward to seeing a lot of familiar faces in July at Atlantic Station," said Sock. “It's going to be a strong US Open Series event to start the summer, and I'll have to be at my best to win." In keeping with the BB&T Atlanta Open's tradition of kicking off a star-studded week of ATP World Tour action with something unique and different, two of the biggest stars from the WTA Tour -- Williams and Bouchard -- will play a feature exhibition match on Sunday evening, July 23 on Stadium Court. Williams has been ranked No. 1 by the WTA Tour on three separate occasions has won seven Grand Slam singles titles, 14 Grand Slam doubles titles, and two mixed doubles championships. The elder Williams sister also has four Olympic gold medals and one silver to her credit. This is a rare opportunity to see Venus play in the Atlanta market. "Atlanta has such a rich sports and tennis tradition and it's been over 10 years since I've had a chance to play a match there,” said Williams. “I'm looking forward to hopefully playing in front of a big crowd and that is also an enthusiastic tennis audience." Bouchard, 23, is a former WTA Tour No. 5 and Wimbledon finalist. She is known for her “off the court” work as well as her shotmaking on the court. She appeared in last month's Sports Illustrated Swimsuit Issue and showed her basketball skills in the 2016 NBA All-Star Weekend Celebrity Game held at Toronto. Williams and Bouchard have a 1-1 career head-to-head. Ticket packages for the BB&T Atlanta Open, the only ATP Tour event in Georgia, go on sale today during World Tennis Day. The goal of World Tennis Day is to promote the sport of tennis and increase tennis participation around the globe. The worldwide platform culminates with the playing of the BNP Paribas Showdown at Madison Square Garden on March 6. This year's Showdown features BB&T Atlanta Open players Kyrgios, Sock, and Williams.